Friendly creatures with Pilfer may attack an extra time each turn. Master of Thieves is an epic Monk creature card. It is part of the Core Set. "Together, we will make a fortune!" 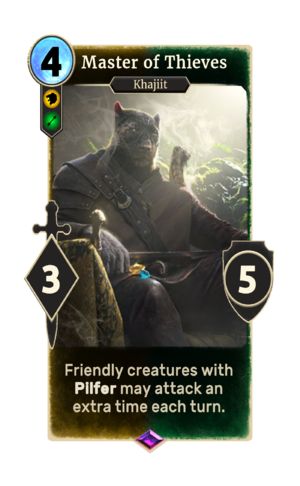 "Khajiit needs coin - and he will have it!" "You will not defeat this one!" This page was last modified on 16 February 2019, at 15:42.